Let's look one final time at last week's trade sequence. 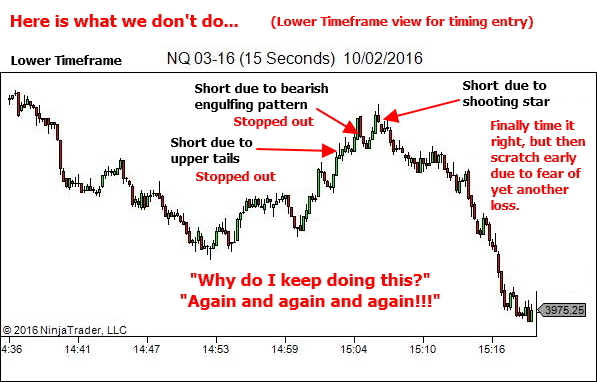 The problem we attempted to address was one of continual attempts to fade long and extended price swings, finding that instead of timing that entry to perfection we more often than not end up with two to three stop outs, and a mindset destroyed for the remainder of the session. Great advice, Lance! As always. I really loved your explanation “Here’s what we don’t do” in the article. It’s so true. It's totally about me in the recent past and so funny to recall. How many times have I found myself trying to get short below every upper-tail candle somewhere in the vicinity of “here’s a support, it goes down now”, only to get stopped out. A daily and weekly review process helps me to get rid of these dumb trades now, but it's really cool to refresh this experience by reading your article. Thanks! Glad you enjoyed it. "Getting rid of dumb trades" is a great plan for driving progress. I still do dumb trades. We all do. But if you can identify over time those dumb ones that you always seem to repeat… they're the ones you can work to get rid of to provide a big boost to your edge. The solution last week was simple. 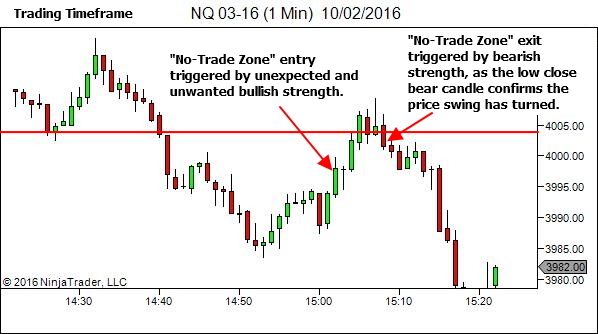 Stand aside during the long and extended price swing. Wait for the market to turn. Only then should you seek entry. So this led to a different kind of feedback, in which people asked, "how do we know when to stand aside?" Let me answer first based upon this particular sequence; and then we'll wrap it up with some general guidance for when to stand aside. So… why did I decide to stand aside during this sequence? 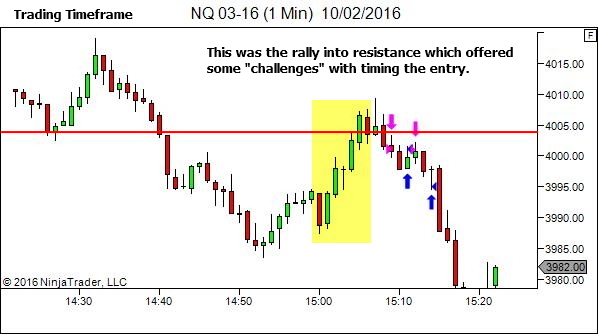 It was the strength in the candles as price rallied to the resistance level. I like to take note of individual candle sentiment. 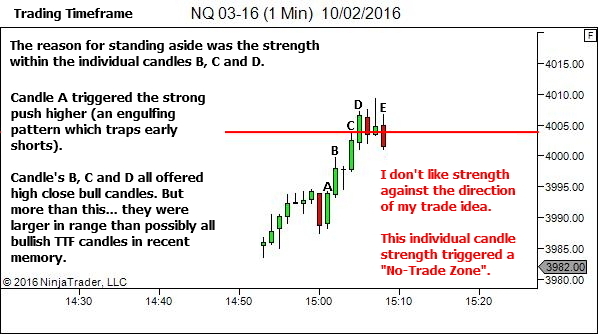 And generally, I hate fading "strong" candles. This is not the only way though. 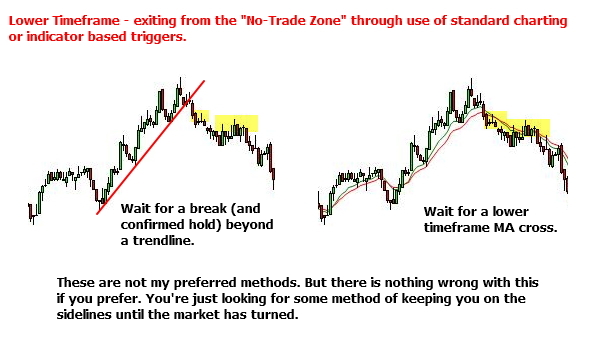 If you prefer you could define triggers for entry and exit from a "No-Trade Zone" through the use of standard charting or indicator-based techniques. 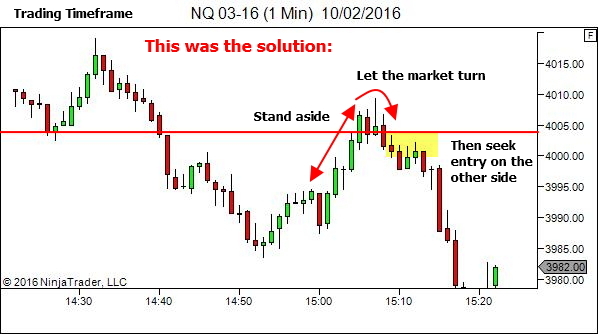 The following image will demonstrate methods which could have been used to trigger an exit from our "No-Trade Zone". Similar methods could be used for entry to the zone. Let's wrap up by moving beyond this one particular example, and talk in general concepts. An effective review process will identify (over time) price sequences which cause you problems. But often you'll be aware of them anyway, even without the review process. They're any price sequence which has you screaming out, "WTF!!! I can't believe I just did that AGAIN!!!" If particular price sequences consistently cause you problems, then find some way to identify the sequence early allowing you to stand aside and limit any further damage. 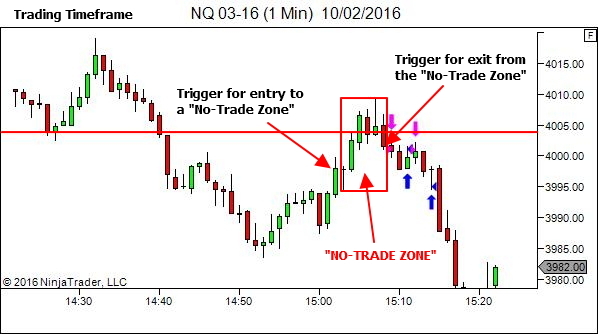 Implement rules to trigger entry to a "No-Trade Zone". Implement rules to trigger exit from a "No-Trade Zone". Get rid of the dumb losses… or at least contain the damage… and you may just find that it provides a nice boost to your edge.